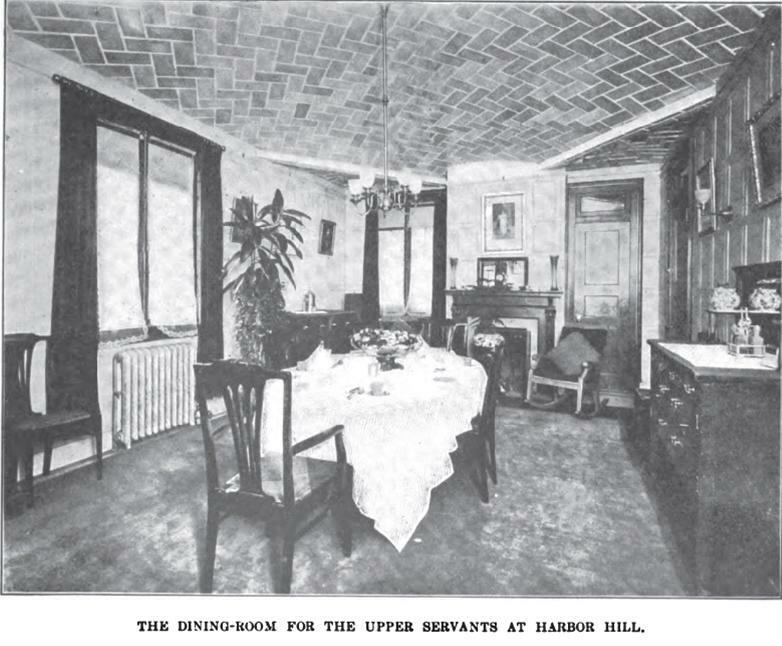 Photographs of the servant quarters at 'Harbor Hill', the Clarence Mackay estate designed by McKim, Mead & White c. 1899 in Roslyn from a 1904 article in Harper's Bazaar entitled 'The Servant Question at Harbor Hill' by Grace Fowler. 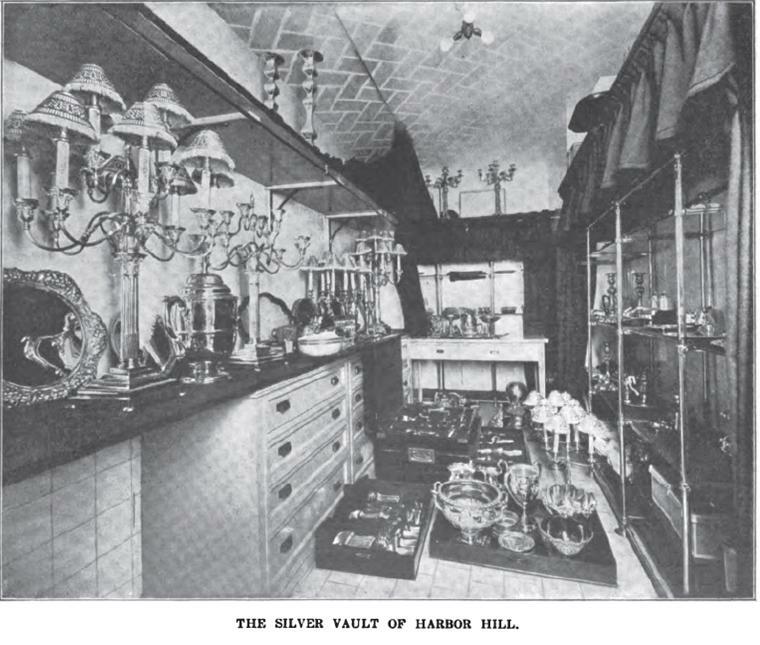 Click HERE for more on 'Harbor Hill'. The backbone of the era of grand houses was the plentiful availability of cheap, trained- or easily trained servants. Sadly, so little remains about how these houses were run and the minutia of the lives of those who worked in them. These photographs are priceless, and if you don't run afoul of copyright laws, I hope you can post the article in its entirety. As a brief aside, it is fascinating to look up some of these grand houses in the 1920 US Census and see the scores of domestics listed as living there- invariably Irish, Scottish Swedish and Finnish immigrants. 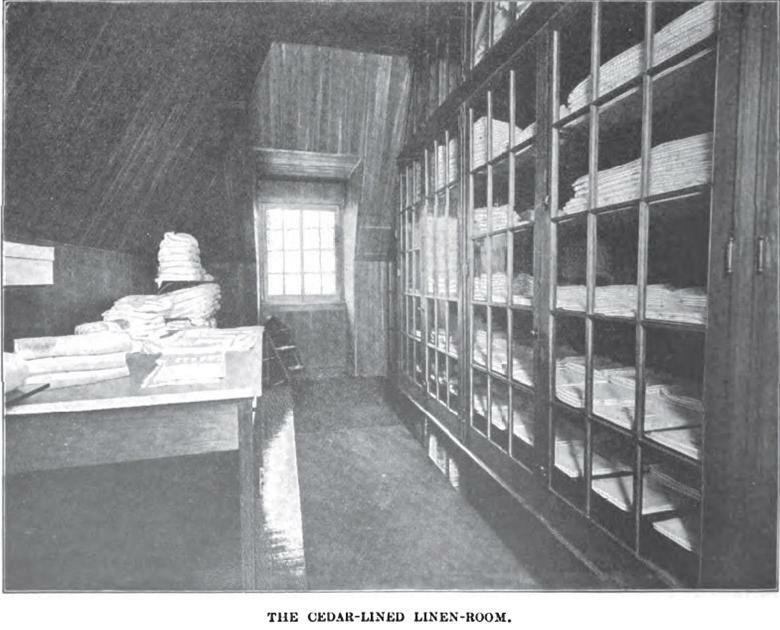 Then look up the same house in the 1930 census: Typically, only one or two servants remained in the family's employ for that period, the rest replaced with an entirely new crop. 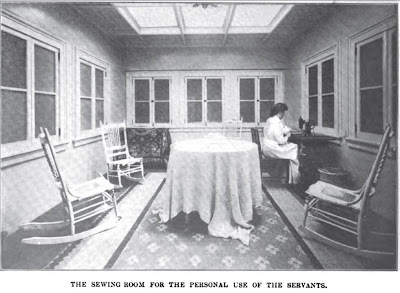 Clearly, life-long domestic service was not an American phenomenon. 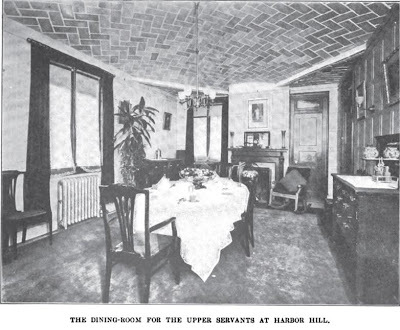 Very interesting to get a glimpse of the staff’s quarters at ‘Harbor Hill’ – & I’m relieved to know that the upper servants had a much nicer dining room than the second servants & could eat separately from them (sarcasm combined with mild amazement). The ‘Harper’s Bazar’ [sic] article continuously praises Mrs. Mackay for her administrative skills that keeps the entire staff happy & anxious to serve her & her guests all the live-long day (more sarcasm). I also noted the article ended with an observation that the gatekeeper is almost to be envied in “his picturesque little vine covered lodge.” – which makes me wonder what gate lodge Grace Fowler was thinking of because the photographs that Zack has posted doesn’t make it look either little or vine covered. The grand-daughter of a Glen Cove neighbor told me that her grendparents embarked on a tour of the Far East in the early 1920's. They returned from their trip with silks and porcelains from China and from Japan....a butler. She sent me a photogrpah of the very distinguished Japanese gentleman in his swallow tailed coat posed in front of her grandparents house to prove it. By 1930, he had clearly decided domestic service was not for him, and he had moved mid island to take up "chicken farming", according to the census taker. I don't know why, but this story has always made me chuckle. 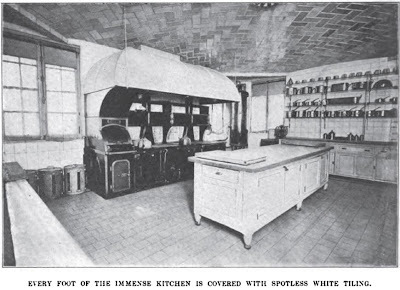 Although I certainly wouldn't want to change places with any of them, my guess is that domestic service in the United States, typically with plentiful food and regular wages, was a step up for many newly arrived immigrants. And in a new country blessed with a strong educational system and permiable class barriers, many of their children enjoyed very different, far more prosperous lives than would have been available to them in "the Old Country". I don't for a minute, however, want to minimize what must have been the daily grind of domestic service. 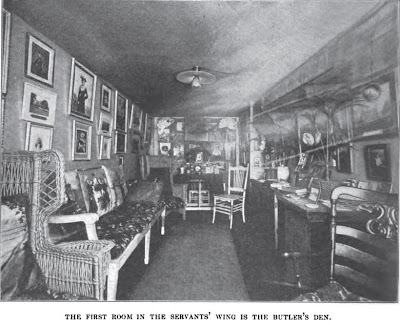 I'm suffering from an attack of claustrophobia just from even looking at that photo of the Butler's den. Ewww. There does seem to have been some effort to make life comfortable for the staff---although I'm betting that cheery paean to Mrs. MacKay was not really shared by all the servants---how could it be? Still, a fascinating look into the other side of the Great estates. I don't recall where I read it....but it was an article on domestic life in America around the turn of the century, and the one thing about the article that has stuck with me all these years, stated that domestic service in the grander of houses was a job that many aspired to because not only for regular wages, free board and food, but also free medical care from the particular families doctors and local schooling for the children. I agree with both Magnus & Anon 9:28am – domestic service in the US 100 years ago at least provided good food & a clean, safe place to work. My earlier sarcasm was because of a) that ridiculous & naïve article by Grace Fowler & b) my modern amazement at the hierarchy which existed inside those large, domestic staffs – much of which I’m sure was created by the staff before it was adopted by the employer. But I agree with the Japanese butler – it was probably easier & more rewarding to look after a farm of chickens than a wealthy family (no offense to anyone). I remember touring a historic house in Minneapolis & in the master bedroom there were two call bells – one for the day & the other for night. 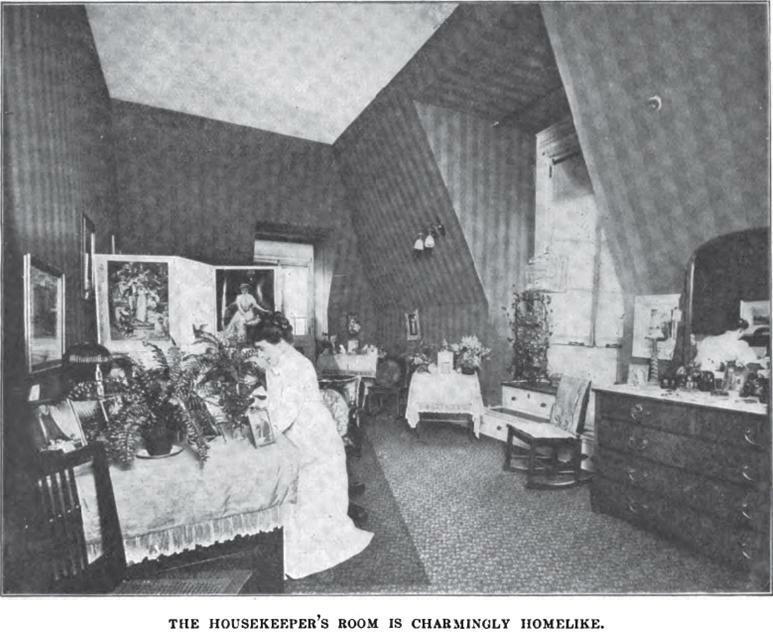 The tour guide explained that if the mistress of the house awoke in the middle of the night & decided she needed a glass of warm milk to help her get back to sleep she thought nothing of using the night bell to awaken a servant who would be dispatched to the kitchen to fetch the milk & then could go back to bed but the servant would still be expected to awaken the next morning as if they had a full night’s rest. Now imagine doing this for people you don’t even respect – I won’t name names (but I could) … I think most of us could. What do people do for help in the huge old manisons today? Do they hire an outside landscaper to take care of the lawns and gardens and just a couple of house people for the inside? My older brother used to be a caretaker for an estate in Montauk...( a rather ugly 1980's compound...but still considered an estate by most standards). He hired out everyone from the cleaning ladies to the landscapers, to the plumbers,carpentiers and electricians. He was not offered a place to stay on the estate and had to pay rent, and for the longest of times he didn't have medical coverage. I also felt bad because he was on call 24/7 and it was always a hassel for him to take a vacation or come home to Nassau County for the holidays. So I'm not sure if that was just this one family, or if this is now the standard hiring practices for people with wealth. Anon 11:18- you make a good point. I think the "forever on call" nature of domestic service is what makes it fundamentaly unappealing, even when an employer attempts to be as considerate as possible- and many don't. 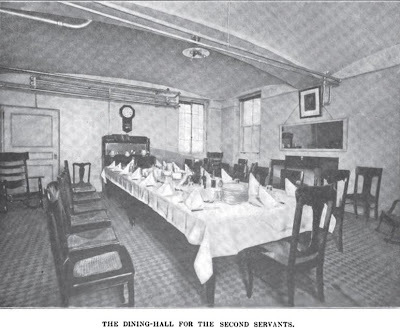 I remember reading that after the 2nd World War, many upper class English folks were astonished that their former female servants elected to continue working in the factories to which the call of War had taken them, rather than return to domestic service which was, in many cases less grueling and certainly less monotonous. "Freedom" was the reason most often given. As to what folks with these huge houses do today? The answer is "make do". 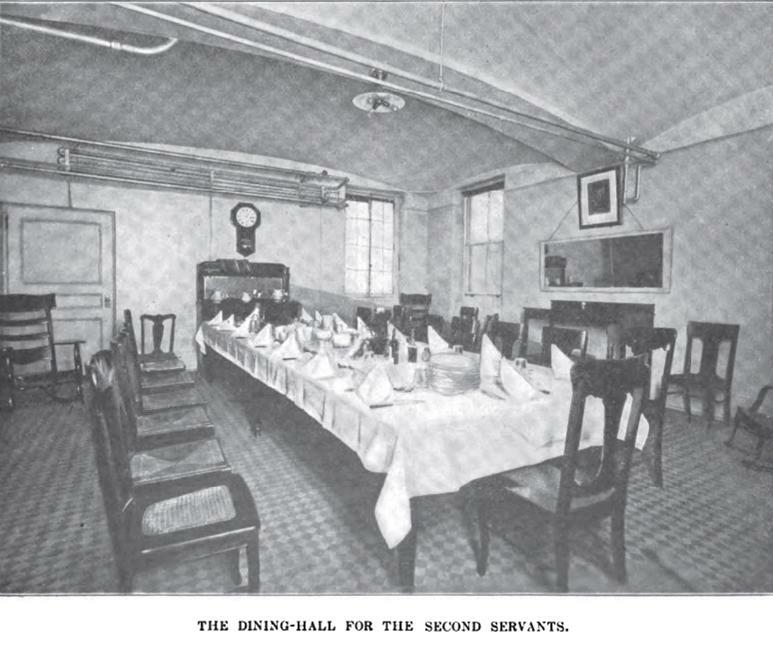 While I deplore the "Great Room" invariably carved out of the domestic offices of these large houses by their new owners, I suppose that when you are your own chef, butler and footman, the idea of shlepping things into the dining room and back again quickly loses its appeal . Typically, a gardening service and daily cleaning help has to suffice. And many of the richest people today- the hedge fund and private equity folks were raised without live-in help and seem uncomfortable with it. They find it "intrusive". Me? if I had my druthers, my house would be staffed like Harbor Hill at its zenith. As previously stated, many of today's big houses depend on maintenance service companies for most work that is beyond the duties of the core group of regular household staff. The exterior washing of windows, cleaning of gutters, installation of Christmas decorations, etc., can all be initiated with just a phone call in many areas of the country -- at a price. My own cottage is in an area of several 1920s estates, though not nearly so grand as this, and my neighbors have a crew of some sort every weekday in addition to their regular staff. If I ever aquired the wealth to afford a great home and a staff, I would definately invest in a cleaning lady, a chauffer (to drive my mother and sister about so to free up some time for me), and I've always dreamed of having great walled gardens,rose and herb gardens and huge greenhouse (like at The New York Botanical Gardens).....so I wouldn't mind investing in a ton of gardeners. I would have a head houseman, since this will not be my primary home as I live in Florida. I have dreams of owning one of the great Gold Coast estates. I would also have it opened up for limited tours so people can have another look at the great old world. I would restore the manor to the way it used to be except for the kitchen and the baths. What a fantasy world. You gotta love this little piece of propaganda ––– "...all the house servants' rooms are located in a wing sufficiently removed from other portions of the house to cut off entirely the sound of any hilarity they might care to indulge in." Reminds me of the character of Julia Sugarbaker on Designing Women when she pointed out the same hypocrisy when southern gentlemen portrayed slavery as little more than employing "...happy darkies, singin' in the fields..." in the more appropriate and "Christianly" sober work of harvesting cotton. Not that I wouldn't have given my left eye in that day to be one of those servants; my grandmother lived nearby, and knew some of the old-timers from her congregation who stayed on in town after Harbor Hill was closed. Apparently Mrs. Mackay was the stern taskmaster, more respected than loved, but Clarence was just an ol' marshmallow who even funded a servant's marriage & subsequent move off-grounds, even buying them a car for the mini-commute. I would love to see that footman's shutterbug endeavors; what he must have captured on film! I am put in mind of the series Manor House, in which PBS did reality TV one better (again) by staging a season in an Edwardian manor house, a la Upstairs, Downstairs. Security word - folype: a benign growth on the scalp. Some of us had a discussion about this general topic over at Dilettante's in a thread regarding Brooke Astor.